Surfnetkids » Tech Tips » Cell Phones » What is Qi Wireless Charging? Qi (pronounced “chee”) wireless (or inductive) charging is a new standard in charging mobile devices without plugging them in (hence, it’s wireless.) 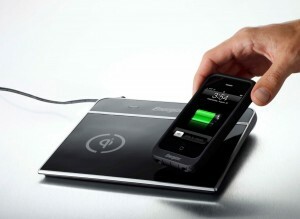 Instead, the phone or tablet device is laid on a mat, and is charged via induction. Not being an electrical engineer, I’m not sure exactly what induction is, but it does have something to do with a magnetic coil in the device or special sleeve. The great part about it being a standard, is that many devices and companies are supporting the same technology. For example, you can buy Qi charging mats made by Energizer or Duracell (just to name a few) and they will work with a variety of Androids, tablets, and with iPhones using a special charging case (also known as a sleeve.) My daughter and I were recently in a Starbucks in Boston where Durcell was giving away free charging sleeves for the iPhone 4, and free charging power connector for other micro-usb devices such as my Android phone. Apparently Starbucks is rolling out Duracell charging pads in Boston for a trial run. I can see this technology gaining traction, and built-in Qi capability is on my must-have list for my next Android phone. To get an idea of where this technology can take us, take a look at this Qi-charged basketball..
To see Qi wireless devices on Amazon, click here. Feldman, Barbara. "What is Qi Wireless Charging?." Surfnetkids. Feldman Publishing. 13 Mar. 2013. Web. 20 Apr. 2019. <https://www.surfnetkids.com/tech/2130/what-is-qi-wireless-charging/ >. By Barbara J. Feldman. Originally published March 13, 2013. Last modified November 10, 2013.